A print version of the book will be out in a couple of weeks (the print process is longer). Stay tuned! 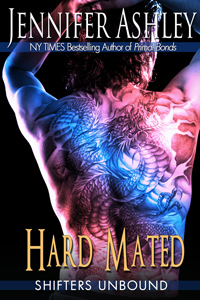 Hard Mated is scheduled to be out Monday, Aug 20 (yay!). It's being line-edited/proofread even as we speak. Because this short novel is indie pubbed, it can't be preordered, but as soon as it's "live" I'll send out a newsletter blast announcing the fact (as well as posting it here, on Twitter, Facebook, and my website). Sign up for the newsletter by going to: http://www.jennifersromances.com and choosing "Join Newsletter" on the right-hand menu. Because uploading books on the Amazon, B&N, Kobo, and other sites is not an exact science, don't be alarmed if it doesn't show up on the stroke of midnight on the 20th. I will do my best to get it live, but once I upload the files, the timing is out of my hands. It's usually pretty quick, though (24-48 hours). For those in the UK and other countries, it does take 3-4 days to cycle through to those sites. A print edition of this book will also be released as soon as I can get the cover made and the print proofs back to me for checking. That takes about a week or two, depending on a couple of factors. Now then: I am also working on Nightwalker, which I had to set aside to get Hard Mated out in time. Nightwalker is in its second draft. Meanwhile, I have to go through Elliot McBride one more time for my publisher, and because I want that book to rock, I have to drop Nightwalker once more and finish that by late next week. On top of all this, I have to write a novella for my publisher to turn in Sept. 1 (for the anthology Unbound out in March). I will be working on Nightwalker around that, hope to have it out sometime next month. And then I have the next full-length Shifter novel to get to my publisher by Oct 1. Someday, I'll get to breathe! It's Time for the Mate Claimed ARC Giveaway! This giveaway is now closed! I have contacted the ten winners, and will post a congrats to them when they have replied to me. Thanks everyone for playing!! I have TEN advance reading copies of Mate Claimed that are looking for good homes. To be in the running to win one, leave a comment (please make sure you give me a contact email!! you can make it cryptic or leave spaces to avoid spam-bots). In your comments tell me why you wanna win, or any message you want to leave me (polite ones, LOL). I will take names until SATURDAY AUGUST 11 AT MIDNIGHT PST.